By LUDWIG VON KOOPA - It's obviously salsa. Apparently, we need more than one Splatfest about condiments. You may remember the first official Splatoon 2 Splatfest was about Mayonnaise vs. Ketchup. I sided with Ketchup. Ketchup lost. 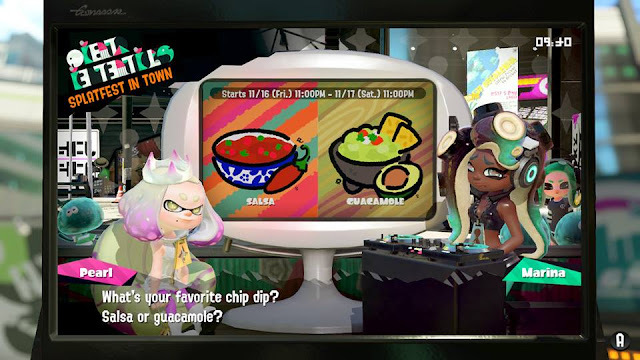 This time, the Splatfest for this weekend (November 17; I highly recommend participating in it instead of playing, or buying, a Pokémon: Let's Go game) is about Salsa vs. Guacamole, in a battle about which chip dip is superior. Strangely, Pearl is siding with Salsa and Marina is siding with Guacamole. Yet in Mayonnaise vs. Ketchup, Pearl sided with Mayonnaise and Marina sided with Ketchup. Reminder that Salsa is made from tomatoes. Guacamole is made from avocados. Mayonnaise is made from eggs. And ketchup is also made from tomatoes. Ludwig with a giant bag of Kirkland Signature (Costco) corn chips, and a serving of Newman's Own Mango Salsa. As for guacamole, I find it incredibly suspicious. As far as I can tell, it's the prime product of the Mexico-dominated avocado industry. It's shortened to “guac” to try to seem hip to non-Hispanic American Millennials or something. Seems like the type of thing that marketing departments have put a lot of investment into, but the product itself doesn't match the purported greatness. If I'm consuming mostly the dip and not the chip, for sure I want salsa over the likes of guacamole. Regardless of which condiment you pick (salsa will win Popularity), please don't eat chips with condiments while playing videogames. May this be Marina's first loss in the post-Version 4.00 Splatoon 2 Splatfest scoring system! By the way, if you want even more things to do that don't involve playing Pokémon: Let's Go, maybe check out the GameFAQs Character Battle X? Tonight, they just started the Divisional Finals, so Ludwig has updated his coverage and voting selections for that entire round. Pikachu is up right now, so you should vote against it. Speaking of votes, will you vote for Team Salsa, or Team Guacamole? And do you have any advice for Ludwig's self-conscious consumption conundrum? The Splatfest before this was Trick vs. Treat. The next Splatfest is Heroes vs. Villains. I got lucky with the timing of this Splatfest because I just got our new apartment and have to work on moving next week and therefore we would have to disconnect the internet temporarily to transfer it to the new place. Maybe I will make a homemade salsa to celebrate whether it wins or loses for the new apartment when we finally fully move in. I do really like avocado itself, especially for the healthy fat. I am a very thin person and have to eat a lot of calories to maintain a healthy weight. I feel awful just shoving in me tons of junk food all day just for calories. I feel very fatigued from that and I have a much harder time functioning and taking care of my child. I do not like guacamole though. You got lucky with the article timing too 'cause this just got published...! How is guacamole prepared in that you like its ingredient but you dislike its byproduct? Maybe it is because just can't feel the avocado taste I desire anymore. It is pumped with loads of other ingredients. or maybe I just got unlucky with the spreads I have tasted. Maybe I should also consider making my homemade guacamole when moving to the new apartment which has the majority taste be avocado. It's a good thing I have no interest in Pokémon: Let's Go. Money is tight right now with the apartment and moving. Forget the homemade guacamole. Homemade salsa, only! Looks like I only need to work on homemade salsa. How is this even a debate? Guac isn't even SPICY! Also, much love for the "consistency" pun. And avocados are unappetizing mush in the deceptive shape of a fruit. Maybe people don't like spice? You see in the picture my salsa is Mango Salsa, which isn't as spicy as salsa can get. Still plenty more appreciable than guacamole. I'm in love with my own wordplay in this article, so thank you for noticing. Avocados are apparently berries, which sounds like they're masquerading as something they really aren't. As you said, DECEPTIVE.